Kara's 'I love shoes!' reviews: Fitflop and Oliveira | StyleAble Fashion For Everyone! One of the many choices us women have to make each day, is whether to wear flats or heels. We also know that either choice can have its drawbacks. Flat shoes are usually comfortable and practical, but can look pretty frumpy. Heels make you look amazing, but after a long day you wish you had put on your less attractive but oh so comfy flats instead. So with that in mind, I have been given a couple of pairs of shoes to review that could make the choice a little bit easier. 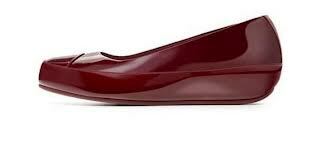 The shoes I have been given are made from an extremely glossy patent material in a sort of burgundy colour. To me, they look surprisingly cute. Try to imagine ballerina pumps but with straighter sides. However, unlike ballerina pumps, they are so much more comfy due to a number of changes Fitflop have made. The straighter sides make them less tight, and there’s also ample room for my toes. As you know, the soles on ballerina pumps are wafer thin, which in my case make my feat hurt pretty much the same as heels would after a long day. In contrast, the soles on these shoes are rubber and are at least an inch thick. The insole is made from a foam material that I believe was specially designed by Fitflop. Combining the two together ensures you won’t feel every bump in the pavement. You’d think that having chunky soles would detract from how nice these shoes look, however they’ve gotten around this problem by coating the edges of the soles in the same patent material the uppers are made from. If they didn’t do this, I think the shoes would look pretty bulky. I have yet to wear these out anywhere, but to be honest I’m really looking forward to it. I don’t think I’ve ever had a pair of flats that look fashionable and are a pleasure to wear – it seems there is a first time for everything! 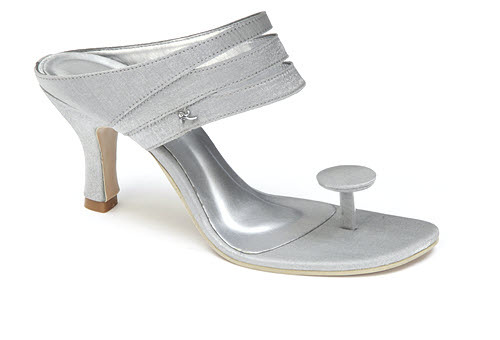 Oliveira shoes are quite unique in that they don’t have anything to go over your toes, instead relying on a toe post with a satin covered button on top to keep them from falling off your feat. The pair I have also have 3 leather lined satin straps going across the top of the foot. On one of these, there’s a fancy shiny rivet in the shape of an A, which according to the website is Maria’s trademark. The insoles are leather lined, with satin towards the toe. Unlike Flitflop, these shoes have 3 and a quarter inch satin covered heels that are kind of like stilettos, but are slightly wider at the bottom. They are surprisingly quiet because of the durable plastic tips on the heels, this should also make them last a long time before wearing away and can be replaced. Like the shoes themselves, the box they came in is also very unique. It’s made from clear plastic with metal corners and opens up like a drawer. The idea is that you can stack your shoes in these boxes, making more room for your shoe collection and allowing you to show them off in the process. You can actually buy the boxes on their own from Oliveira, but at £5 a pop, this could be quite expensive especially if you’re like me and have quite a lot of shoes. It would also amount to a guessing game if you’re blind, unless you can remember which pair you have in each box! My first thought was “oh no! They have toe posts on”. However, after putting them on and walking around in them, I actually grew to like them. The toe posts have a soft glossy outer coating which helps a lot and means that they don’t chafe as much. These shoes are actually quite comfortable to wear, although if I’m going to have them on for a long time, I’d use jell pads with them. I keep thinking that they’re about to fall off especially if I walk up or down stairs, but that button really does a far better job in keeping them on than I first thought. These sandals would be perfect for summer if you want something that’s a bit different. They would also look amazing with a nice dress for a special occasion.